NO SHOPPING CART-- WHY NOT? Are you tired of chasing icons? Click, click, go back, click some more, back up, head in another direction, way into some web site jungle? And, when you get to the end of the line, the piano part you find is for a grand piano, but you have an upright. Or, the casters look great, but they look like they go on a Mack truck, and you have a very small spinet, right? Instead of a shopping cart at the end of a zillion clicks, we offer an online catalog that LOOKS like a catalog, and it has lots of choices per page. Links are not back four clicks, they are right there on the same page so that you can keep surfing in a forward direction. Revolutionary, right? No, Steve simply decided in 1995, when we went on the Web with this business, that his site would not be dedicated to web page designers. It would be designed for PEOPLE, shoppers, piano owners, like you. Once you decide you are pretty sure what you need, you pick up the phone (800) 338-8863 and talk to ME, Steve, 24 years of experience tuning pianos. Maybe you are still not sure, or maybe Steve will ask several questions and decide you need something different. We work it out on the phone so that you get the right dooo wap for your dear old Kimball. From day one we determined to talk to you, not bore you with clickity clicks and suspense as you hit the last click and wonder if you bought the right thing. We have almost NO returns because of our quaint plan. If you are a Silicone Valley or Seattle geek who loves to click buttons, you should go to our competition. They ALL have the traditional shopping cart, and they all have lots of returns. "Was that YOU who called on Sunday?" Be warned-- On Saturday and Sunday we will not talk to you on the phone-- we arrogantly ignore your longing ring from Seattle and Bogalusa, bunkie. Why? 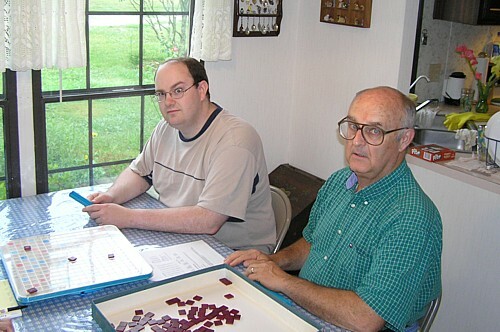 We are family people, and we like to play Scrabble and do Bible studies on the weekend. Stop by, and you can join in the fun. We are presently working our way through the Bible book of Job. Also, none of your ordering data is on anyone's hard drive-- only on paper. Weird, right? Well, not at Bank of America and VISA. Recently VISA and B of A sent us a threatening letter, as they did to all credit card processors. It was all about security, and we were to jump through a dozen hoops to be approved by their people. If we did not do this, we would be fined up to $ 500,000. Terror all around in large portions, right? Moral: Cyberspace is NOT fool proof. Chase Manhattan Bank lost a bundle of their customers' credit card data recently, as did MasterCard. I must stress this-- we are not cheap about this-- we did it on purpose in 1995, and we have been laughed at by several tax people for not storing all your numbers on a computer. Go figure. Finally, let us get to know you. Shopping cart buying is like eating out at the drive up lane at MacDonald's. If you don't like people, go for it. We want to get to know you, and the phone is the next best thing to coming by our home in Michigan and picking up your piano needs. Furthermore; it is an old Dutch tradition, yah?